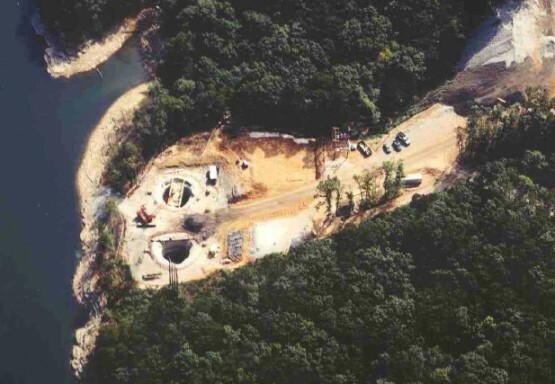 As a sub-consultant to MWH, Bennett Trenchless Engineers conducted the feasibility/preliminary design evaluation, planned and conducted the geotechnical investigation, prepared Geotechnical Data and Baseline Reports, evaluated alternative construction methods, conducted a design workshop, and provided design services for twin intake shafts and eight 60-inch diameter intake tunnels to triple water supply capacity from 80 MGD to 220 MGD. The twin shafts were 30 feet in diameter and 100 feet deep, excavated through very challenging karstic limestone and fissile shale. The eight 60-inch tunnels varied from 90 to 160-feet and required underwater retrieval of the MTBM after each bore. The limestone contained numerous solution features and caves, and had unconfined compressive strengths up to 28,000 psi. Bennett Trenchless Engineers provided full-time construction management/inspection. The project was completed within budget and schedule, with no claims.